How many cups of coffee do you wish to brew at a go? The Hamilton Beach 49980z Single 2-Way Coffee Brewer gives you the option to choose between brewing 1 cup of coffee or 12 cups at once. As much as many people agree that its cheaper to brew your own coffee at home compared to buying it at your local coffee house, no one finds it economical to buy two separate coffee brewing machines to handle your whole family’s needs. 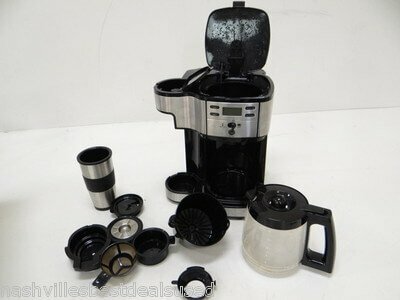 The single 2 way 49980z coffee maker from Hamilton Beach solves both problems. It’s considerably cheaper compared to buying two units and, allows you to enjoy coffee any time you want it. If you’ve ever tried brewing a single cup of coffee with a large capacity coffee maker, you probably understand the frustrations that come with the process of measuring your grind and water to ensure the brew comes out just right. This coffee maker solves this problem in a unique way. It includes 2 separate coffee machines in a single unit. With it, you can easily choose to brew a single cup or up to 12 cups. Each brewing side comes with its own water reservoir making it easy to simply pour in water and start the brewing process. Each side also features its own filtration system. The single cup brew side includes a meshed filter and can also use pre-packaged pods making it possible to get your coffee fast. The 12 cup side also features a glass carafe which rests on a non-stick heat plate. This keeps your brewed coffee hot for several hours. Also, with this equipment, you are getting home a single serve coffee maker as well as an ideal drip coffee maker that makes great cups every time. One of the cool features of the Hamilton Beach 49980z is its programmability. If you’re among the many coffee lovers who find it inconvenient having to wake up every morning to start brewing coffee, this unit will make your life much easier. 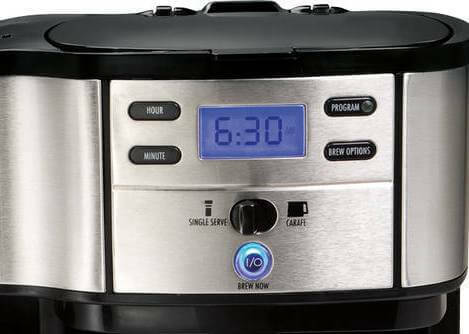 It has an easy to use control panel which allows you to set brewing to begin up to 24 hours in advance. You can even set the brewing process to being at a specific minute of a specific hour. The programmability feature is complemented by a non-stick heat plate upon which the 12 cup carafe is set. Once the brewing process is complete and the carafe is filled, the hot plate automatically keeps the coffee hot for up to 2 hours after which it automatically shuts off. The Hamilton Beach Single 2-Way brewer features a meshed filter which allows you to brew from freshly ground coffee. This coupled with the brew strength selector allows you to choose between regular and bold brews. The bold strength option gives you several options to choose from depending on what your taste buds fancy. 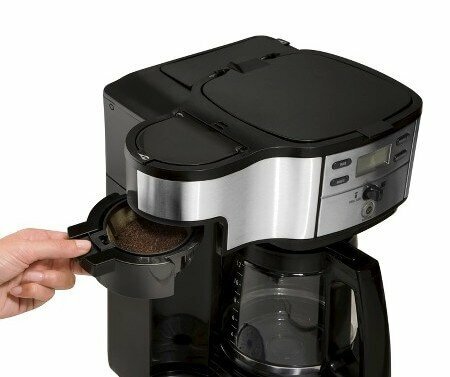 Besides using ground coffee, this coffee maker also allows you to make your coffee from pre-packaged pods. This feature comes in handy when you simply need a quick shot of your favorite coffee brand. Coffee making machines should be easy to use. Unfortunately, many of the automated units include features that are completely useless or, make them difficult to use. This is not the case with the Hamilton Beach 49980z coffee maker. Every feature is deliberately included to ensure that your brewing process runs smoothly. The control panel includes minimal features that are focused on enabling you to set for brewing time. Two separate reservoirs with the larger one clearly marked makes it easy to pour in water for brewing. A multilevel cup that rests on single serve side ensures that you can safely pour hot coffee into your favorite cup. Other features that make this coffee making machine easy to use include the non-stick heat plate, dishwasher safe parts and ability to brew coffee from fresh grind or pre-packaged pods. Getting a hot brew of coffee every time you wake up is a reality for many coffee lovers thanks to fully automated coffee machines. However, having several coffee brew strength options and choosing between making a single cup of coffee or 12 cups separately in a single automated unit is quite rare. 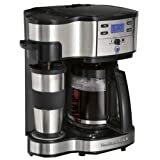 The Hamilton Beach 49980z Single 2-Way coffee machine offers this at a highly competitive price. This coffee machine comes in a bold stainless steel design that’s durable and attractive. Unlike many automated units which come with countless bells and whistles, this coffee brewer only includes features that you need to get the perfect brew of coffee. It might be slightly larger than many coffee machines but compensates for this by having two separate water reservoirs which make it easy to brew your coffee fast. If you regularly shift between brewing several cups of coffee on weekends to one or two cups right before heading to work, this coffee machine is worth investing in.